Nice to see someone finally found a use for them ^^. 1 Small problem; have you actually changed anything in the package.cfg file? As I somehow get the wrong textures. Could be me as well of course, I just want to know actually. Judging by the picture alone, you should add some small lights along the yellow lines. Maybe take a look ingame and tell me, why you wish to have small lights there? I've only noticed a couple problems on this map. There were no texture or lighting problems as far as I could tell. This textureset looks quite nice. The large pipes on a diagonal wall in the main central room are clipped square, and if you jump down from the rockets, you bump the clipping but not the pipes. Also: Alpha texture prevents skytexture from showing? Cool, I didn't know that! I clipped those pipes, so you cannot sit on them. I will try, if it makes a difference without the lower clipping. But i think, you still bump into them, if you get closer to the walls. It is no problem though, if you jump while pointing at the shells. Maybe i will just push the pipes a little bit into the wall. I have been trying to find a good spot for the teledest. You are right, but i do not want it to be too close to the tele. I will experiment a little bit further. But as you said, you know, how it "behaves", if you entered that tele one time. If you jump, the flow is nice. You can also turn right immediately and fall down on the healthboost. What do you mean by "chain together" green and yellow armour? That will probably not happen very often, since you are not able to pickup the green armour, when you have the yellow armour. The only time could be 9.40, when the green armour spawns and someone tries to get it and pickup the yellow one afterwards at 9.30. But then you take the risk to get camped/shot (by rifle e.g.) and your opponent could get/defend/control the yellow armour. About the health: I put to healthbubbles together close in that corner, to make people actually go there. You would hardly move there just for a shells pickup. I know the healthboost is close, but i only spawns every minute. So if people do actually time or listen to the announcer it will not be there for long and the room yould be almost empty. there 4 pillars and one unique plain platform with a layout inside, and when you observe the outside of the map its looks like an unfinished map, exactly the same in a lot of maps. to avoid this normal aesthetic problem i recommend to add more buildings and details instead of unique pillars, nieb fills many of his maps with terrain, but its never recommended to left it like a "clipped space with pillar filling"
Thanks for taking a look and for the kind words! I do not care so much, what the map looks from the outside, but you are right: Those towers indeed look a little lost, even from inside the map. I am thinking of a new "more filled" background right now, but i am not really sure, what direction i should go. Maybe you have any more concrete ideas or can point me to a map with a good background-solution? I am not sure, how detailed it should be, since it is just a background. I've found that I personally put too much detail outside the play area of maps, which makes it look nice for panoramic views of the map. However, when playing maps, you generally don't notice such details. I think the least important details are those on ceilings, unless the tactical gameplay in an area requires players to look up. Don't kill yourself putting detail if it's not somewhere players will be shooting at. If players would be looking up a flight of stairs, you can put something above and beyond there because the players will have a reason to see it. IMO the towers on this map look a bit out of place but it doesn't matter because they will generally only be seen in players periphery vision. The towers would be better with different detail, but just don't bother making them MORE detailed. In terms of more background, that probably doesn't matter much, because unless you cut holes in the sides of the map, it will all be above the players. I can't think of an example of a map that only opens up above through holes in the ceiling with much detail outside the map. I'll add on to this post if I do. Nice job. I just took a quick peek and it looks good. I like the layout, overall flow, and style. The first thing gameplay-wise that really stuck out to me was the teledest on the ledge, which was already pointed out above. What about just switching the teleporter and healthboost? Then the HB will be in a corner which can only be reached by jumping, which could make for some interesting situations. Also, I'm not sure about the teledest in the middle of that upper hallway; it just seems like a strange place. Also a random thought here: those planks you have tilted in places are a nice touch, and you could use more of those to bridge some gaps, such as the one in the screenshot above. Maybe even the one going to the other tele, if it didn't interfere with the stairs too much. Hello mIscreant! Thank you for your feedback (and vote). It is nice to see, that there are still some people around, who actually care/think about architecture/item placement and its effects on gameplay. At the moment I am busy trying to reduce wtr by skytexturing (the 45° trims) and adding some more background. I will try your suggestions on swapping the teleport and the healthboost. It sounds interesting, but I think, it will put the healthboost in a too strong and well covered position. The place, where it is now, can recieve rocketspam and rifleshots through the lower entrance and it is lower than the two platforms, which makes it harder to sit there and defend it. That is, what i thought, when putting it there. But i will nevertheless try and check out the effects of your proposal. Putting a plank in front of that teledest makes the stairs too cramped, you jump against it. I moved the teleport and teledest back a little though, to prevent players from falling down onto the stairs immediately. The function of the teledest in the hallway is to put the lower player (under the yellow armour) in a better position immediately and to make it harder to defend the yellow armour spot. The .zip will be uptaded within the next week i think. I should also write a more informative readme. Yeah, fitting textures are a great improvement, I remember when you showed it to me and I had to stand the default ones.. I really like the map's layout, although you did a good job on clipping.. a real good one. In my opinion you clipped too much, It would be nice if you removed some of the noclip above the HB room' entrance. It would spice up the ways on the outside; you could jump from the upper side to the GA platform with more air control! Secondly, on the entrance's inside, you really expect to be able to stand there, so please let us! Very nice 2 way tele, nice weapon placement, ty for skimping on health pick-ups. I wasn't able to replicate the problem. 1. Clipping/Noclipping: You mean to remove the noclip at that screen, to be able to stand on the lamps? I had the feeling the screen actually disturbs the flow to the ga platform. Removing clip from the inside would be logical (if you mean the yellow-black ledge). But i would have to remove the clip from the small platform, where the rockets (main room) are, too. And that really kills the flow there. Maybe i will design it in a different way then. 2. I do not have any idea, how you made the bots spawn up there. Maybe it hasn't got anything to do with the map at all? Playerstarts are all in their places. Time for me to comment. Somehow, the texturing seems right after calling up your version of package.cfg, but I still get some texture errors (somehow you call up files which I've never actually added in the 256p version, as it like ex_wall_pipe_h.jpg, q2_01e_s.jpg and q2_01e_local =S). To avoid any more confusion, please call it package_stahlbox.cfg or initate all textures right into stahlbox.cfg. Why? Because I might want to update the eX-package in the future which would make your map incompatible with it (that's why files as package.cfg are pretty evil config-files, they mess things up). For example, I could add meshes to the grate textures so they really can be used like a grate (that wouldn't affect your map directly, but I often make small changes also like fixing up those missing files). The trims which carry a light-texture in the centre of the map feel like they should emit some light. What about trying so? You could actually fill up the outside of the map with more skytextured cubes, as Cube Engine 2 recognizes that the end of the world "has moved" (should save up wtr and looks more clean). You can also raise the clipping on top of the map while doing so. It also avoids people spawning outside the map, even if there wouldn't be a bad placed spawn (as someone else already stated a bot spawned like that). Don't be afraid, it's only a few minutes of work. I've found a small clipping bug on the map; you still can get "stuck" there or jump on the side of the wall (same counts for the other side of the room). I like the fact that it's more of a kind of tourney map (despite the fact a HB spawns, there is no quad which creates invincible monsters in the right hands). I'm not sure if you should add bullets and riflerounds together, as they are both are still powerful weapons compared to some others (the pistol, shotgun and grenade launcher). Then again, the rest is placed pretty balanced so maybe you should just forget it =P. In my opinion, this node could be promoted to the front page. Anyone (preferable admin or moderator) which agrees or has trouble with it, send me a private message or email instead of starting a flamewar over here. In overall, I would give it a 9/10 as I like nearly everything except the white.jpg which you've used as a trimming, it feels too dull compared to the rest (I know, the eX texturepack misses something like a proper tileless texture. You could also use those of the e6, dsi or e8 texture pack (e8_base1b.jpg seems to have nearly the same colour as the current trim, but with some more contrast in it). There still is some small work to do on the lighting (as I mentioned), but the gameplay and flow feel great. That's why, 9 out of 10! It looks even more awesome in the 512p version of the textures ^^! Seems like some other admin/moderator agreed; congratz, it has now been promoted to the frontpage. i think it deserves to be promoted. Is there supposed to be no texure here? It really would be nice, as mentioned already, to be able to jump on these lights. Even if it meant clipping the screen and risking jumping into it if you don't aim your jump right. It really would be a nice jump :). I personally think this gap was nicer without the plank stretching across, making it necessary to jump to the yellow armour platform. I don't see anyone walking across this anyway, as they will probably just take the jump. If you don't time your jump soon enough, if you choose to jump down these stairs as I mostly did, you hit your head on that ledge above. Maybe a little no-clip would be nice, or raising it up a bit. But then again, It could just be me who likes to jump down those stairs. No, it's supposed to be skytextured. :) Will be fixed for next update. I had noclipped that for a while indeed, but somehow jumping through that ledge felt "wrong" (and looked strange). Raising that wall will leave the ga place too open. I like to jump down those stairs, too. It is possible not to dash your head, just not from too close. Thank you for taking time to look through the map. Well this is not an attempt to change your mind if you are set on leaving it noclipped, but to answer your question, I think it's just an alternative route to the bullets there and is more fun to jump on the lights than to jump straight across, as it looks like you should be able to stand there anyway. I personally love taking trickier jumps and routes to places because that's part of the fun of the game for me, and I think people will expect to be able to jump there when they first see it like I did. And yea, I think I do agree with the platform being there, no disruptions in the gameplay at all, just wasn't used to it at first. You could tweak the shader-settings of some textures to add the atmosphere even better within the map. Just play a little with it to find the right value. This is just something really small though and not particular necessary. I just couldn't find much more to improve =P. Found something; the upper surface of some wires are also skytextured while you can see that surface during play. What does it do? I don't understand much about shaders. And which textures are you thinking of? Edit: Wires will be fixed within the next update, thx. Didn't notice at all. It renders the skybox on the textures. It makes it look a bit like reflective surfaces on Quake 3 (but then a lot more subtle). It's quite worth it to check out as it change the appearance lot. Hopefully the last Update (see node for changes). There won't be any layout-, item- or other major changes to the map, I consider it finished. If you still find some texture- or clipping-fails (hopefully not), I'd surely correct them. Thanks once again for your feedback and shared ideas. @Suicizer: Experimented a little with that shader, but left it as it was. Anyhow, nice to know about that one, I will surely use it in one of my upcoming maps. @Fatality: I see your point. But I will still leave it, as it is. I just do not want people to sit and camp on those screens. Finished? That's not a word in my vocabulary, as far as non-gameplay goes anyway. Feel free to peruse these screenshots and connect the problems i found within a few minutes of looking. I may find more if i look harder, but these were the more prominent ones. Some holes here and there, missing textures, or incorrect ones. At least 2 or 3 of those you found i have already found, except the shot is from a different angle. Best to wait until he has updated the map before searching more. Also, be ABSOLUTELY sure that the spots you say the texture is not needed is not visible from ANY angle from inside the boundaries of the map. The ceiling in the first picture is not viewable from anywhere on the map, as far as I could see, feel free to check it out yourself. The second one I was wrong about. Anyway, just trying to help this awesome map become better, not trying to steal you spot in the credits. Ok, guys! Thanks for checking once again. Here comes a fixed version. Hope i found everything now (and hope I didn't make new fails). I still like the 512p version much more. The 256p version feels too blurry. Wouldn't that drastically increase the filesize? Would I have to align all the textures by hand (since they are double sized)? Takes about 5 to 10 minutes to do so. It probably increases the file size to about 12 to 15 MB, but makes it look that great. They are way more useful as well due the fact they can be used on larger surfaces also. Doesn't sem to work that easy. But the 512 textures look better indeed. Needs some time, though. I hope, it's done now. If you still find more fails/bugs, please report. Maybe one more update. The only thing I don't like about this map now is the billboard-screen-thing with blue lights below it in the main room. It seems like you should be able to jump on the lights, but they're noclipped. Other than that, 10/10 great map. Since i am using mac os x 10.5.8, i will probably never ever be able to play tesseract. I doubt that there will ever be a build, which I can play on this computer. I am working on a version for red eclipse atm, and it's just working fine. Just had to resize the philipk-textures and change the paths to them and find another sand-texture. Things are a little weird in tesseract. Some textures looked ok in size, some were too small. I tried scaling them all through the config but it made no difference. I'm not sure what to do. Just don't load it into Tesseract seems the best and easiest solution. The layout is made for cheetah styled Sauerbraten anyway; not turtle propelled Tesseract. Since Suicizer changed the path structure of the eX-texturepack after Fatality published his map Pandora, I want to make the Stahlbox fit the new path structure of the eX-texturepack. It will be less confusing and I will be able to offer one version including all needed textures and one version without the textures for people, who already have the texturepack. While taking a look at this map again after quite some while, i decided to make some more changes and some questions came up to my mind. - Why is the cretefloor-texture from eX looking so blunt/without shaders/normalmaps (same question for metalfloor02_d)? I dont have any clue about map-cfgs, I just copy and paste. - How can I delete parts of the map from the minimap? I don't want those pipes to be seen in the minimap. I have no clue which specific texture you are talking about; as there are many textures displayed within that screenshot. Only a little is known about how to set the minimap properly. minimapclip (default 0) Can only be set to 0 or 1. It seems to set whether the minimap should project through clipped surfaces or not. minimapcolour (default 0 0 0) Seems to set which colour has the highest priority to be projected. minimapheight (default 0) Although you'll set this in a map's cfg; if you call it up blank ingame, a different value will appear. minimaphere (default 0) No clue where this is about; perhaps to set a higher priority for certain selected geometry? I'm sure they once were described into the docs, but somehow I can't find them anymore. The concrete stuff on the walls, compare screenshots to ingame. The reason why certain textures like cretefloor_01_d looks so blunt when only defining their diffuse texture is as their diffuse texture has no depth from origin. This sounds quite obvious, but only started when normal-mapping and other rendering techniques came around (like specular- and height-mapping). Before those innovations; textures weren't existing out of 3, 4, 5 or even 6 different layers which eventually form 1 texture, but rather have something like decals, glow and even shadows already included within the diffuse texture (look at the ik2k textures for example). So it's not smart to exclude a layer of a texture as that often makes the texture unrealistic. After all, that layer isn't made for nothing right? Do not include the textures within the package of the map. This creates very messy directories. Refer to the original node instead. Those textures do not look blunt in xonotic, though. Seems to be sauer-specific. Edit:Is it a matter of my mapconfig or the package.cfg comingwith the textures in the end? Depends how you actually are calling up the textures. If you are executing the package.cfg, then the problem is probably at package.cfg. That's why I advice not to use the package.cfg directly, but rather copy-paste everything within that file into the map's config-file (and then tweak the settings to what you're desiring). However, by doing so might breaks compatibility with future improvements of a texturepack (if textures are redirected, you'll have to change the map's config-file quite immense to locate the textures correctly again). But that's fixed with minimal effort nowadays, so don't worry about it. The reason why the textures aren't looking blunt in xonotic probably is because their shader system works differently and can assign various layers of textures towards a surface while Cube Engine 2 is very limited to that. 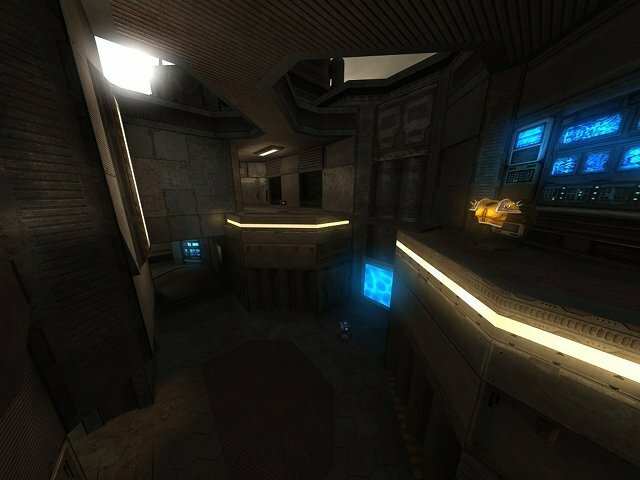 Other than that, Xonotic seems to use bump-, specular-, height-, env-, glow- and decalmapping also just like Cube Engine 2 does. The engine is just more advanced towards multi-texturing and uses a different light system (which often matters a lot; look at Tesseract for example). Thanks. Checked both configs, but couldn't find anything. Seems to be like you said, different shader system at xonotic. Nice, seems like you picked up my idea of adding more Sauerbraten logos into maps ;). Thanks! What map did you put a logo in? Finished! Check the updated file!